Dave's designed so many beautiful, intricate circles and flourishes. Summer is a great time to mix, match and layer them into flowers using the Memory Box 6x6, 12x12 and 8.5x11 prints in your stash. Add a dash of green with a diecut leaf, stem or branch - and you've grown an instant garden of cards ready to send the perfect greeting! The intricate Lavalier Circle Die 98216 makes another great flower - double-layered over a Pixie print diecut using the Small Scallop Circle 98204. 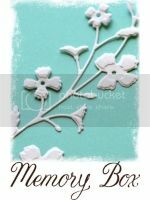 The clean-lined simplicity of the Lorelai Leaf 839 from Poppystamps balances the detailed blossom with a bright pop of Dill Cardstock. Thank You Combo B1751 - stamped onto a Pastry Label 98107 diecut with Very Berry ColorBox Archival Dye Ink from Clearsnap - adds the finishing touch. View the entire Memory Box Collection and Ideas Gallery here. Here's another flowery summer card featuring the beautiful Calypso Flourish Die 98343. It's cut twice - from Taffy and Peony Cardstock - then reassembled in a bright splash of color. So quick, so easy! Cut a trio of labels with the Pastry Labels Die 98107, stamp a quick greeting...and you're done. Try it in other color combinations too - like Violet and Key Lime, Thistle and Cranberry, Bubblegum and Licorice, Squash and Vanilla Bean. Or, use the great 6x6 and 12x12 prints with coordinating cardstock...so many possibilities, so little time! Let the Calypso Flourish Die 98343 brighten someone's day on a simple summer notecard. There's just something about summer that says it's OK to combine bright colors that may - or may not - match. I love how the Peony cardstock seems to jump right off the Kiwi vellum, cut with the Scalloped Circle 98109. See the entire collection of Memory Box Dies here. Diecut a button with the Round Buttons Set 98135 and the dots from the Viola 6x6 set. Stamp a quick greeting with the Just a Note Combo B1852 (there's a teeny note attached to the side of the stamp). Mail Definitions Background G1839, stamped with Clearsnap's new ColorBox Coral Archival Dye Ink, is one of my favorite go-to stamps. It's there where and when you need it, but it doesn't overwhelm the design. Here's another new die from the Summer Collection - it's Cottage Leaf 98342, about 1.6" x 5" - and perfect for any summer card. I've trimmed the top a bit, to create a curvy stem for my sort-of-sunflower here. Fringe Circle 98268 and the center from the Gothic Rosette Set 98249 are some favorites from previous collections - just used in new ways. Select some designs from each collection - and discover unique ways to feature them in your projects. Memory Box Dies are great...temporarily misplacing them during that elusive moment of inspiration is not. I've attached magnetic bars to the shelves around my diecutting area and use them to hold the dies I'm working with at the moment (OK...many moments). After some training, I've learned to attach the dies to the bars instead of setting them down amidst the paper chaos on my worktop. Buy the bars from hardware or kitchen stores where they're sold to hold shop tools or knives. They're very strong - maybe a little too strong for some of our delicate dies - use metal rulers as a buffer zone between the magnets and the delicate dies. Peel off any cork backing that might be on the back of the rulers. Attach the bars (they should have holes at each end) to your shelves with binder rings - or to pegboards. Leave a few inches of space at the ends for pins to push the little bits of cardstock out of the dies. It's just for short-term storage while you're working w/ the dies. Actually organizing/storing them is another project, later.